It has been said that the laws of physics apply in the economic realm. However, it would be more precise to say that the same basic laws govern all dynamic systems. One of the newer “laws” emerges from chaos theory. Put as simply as possible, it states that in dynamic systems, such as weather patterns or water flow (or human social relations), imperceptible initial conditions eventually give rise to greater and greater turbulence and finally to absolute chaos. The chaos however is not permanent, for just as initial conditions give rise to chaos, so too chaos contains within it an “attractor”, a point around which the system begins to revolve, that produces a “stable” system which generally, but not always, produces a perceptible pattern of balanced, unified opposition. The “butterfly” effect is a popularized concept that arises out of scientific chaos theory: when a butterfly flaps its wings in one part of the world (the imperceptible initial condition) it can provoke a turbulent weather pattern in another region of the world. However, it is called the butterfly effect for another reason: because as chaotic movement swirls around an attractor point, a form emerges – the form of a butterfly. Two opposite yet unified parts can be seen (usually but not always). I would argue that the situation in Venezuela is a political attractor point which is leading the world to establish a unity of opposites which will momentarily give stability and meaning to the chaos of the world before it once again ushers in a new level of chaos. One could say that the last great chaotic period of human history took place during World War II. Out of this extreme chaos, and around some to me, unknown attractor, the stability of the world was established by the emergence to two great superpowers, the United States and The Soviet Union. These two wings of a single butterfly, even though they were in nearly perpetual conflict with one still provided a kind of balanced, stable dynamic system – a balance power. When the Soviet Union was no longer there to balance the butterfly, the American capitalist system began to spin, first quite slowly and then with greater turbulence and speed into chaos. The destruction of America’s traditional enemies – socialist and communist countries – a new opposition arose which embodied a particular religious rather than economic weltanschauung, this new opposition attacked America not because it was Capitalist, but rather on the grounds that it was immoral and indecent. Certainly, communists had long made this argument, but now the criticism was being expressed in religious terms. As the war between Capitalism and a unique religious outlook began to take shape, a new form of chaos, called terrorism emerged. It reached full expression with the destruction of the Twin Towers. The war with terrorism rages, at all times, in all parts of the world, and because of this It has provoked its own unity….the unity of nations that suffer from and are opposed to the religious terrorism that is the hallmark of our time. But neither of these, not the unity of the religious opposition nor the unity of the forces allied against it, is a proper “unity of opposites.” For the opposite of capitalism is communism, and the opposite of communism is capitalism. Early on in America’s war against terrorism, it became clear that in keeping with what had been a long-held principle of American foreign policy, regime change would be the order of the day. Before America unilaterally turned its military might against Iraq, the nations of the world had begged and pleaded with the U.S. to show constraint. But in the end the nations of the world neither said or did anything while America “shocked and awed” Baghdad with its bombs. The lone voice that spoke out against America’s “regime change” in Libya – was that of Vladimir Putin. When America turned its eyes on Syria, they confronted for the first time, direct opposition to their desire for regime change. Russia sent in its planes and guns and mercenaries, and America left. We can say that that was the beginning of the great polarization that I believe is coming to a head in Venezuela today. 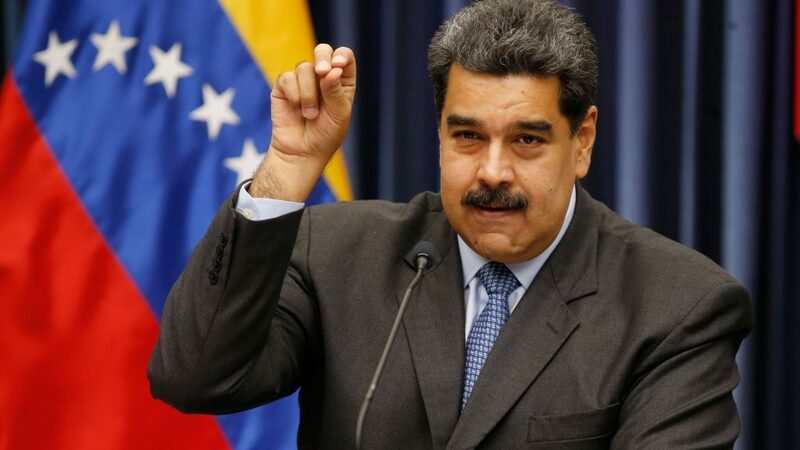 It began apparently, with a call from the U.S. to Juan Guaido, telling him to declare himself the leader of the nation even though Maduro was ostensibly elected president. Once the leader of the opposition had done so, the U.S. secretary of state called on the nations of the world to “pick a side” on Venezuela: “Now, it is time for every other nation to pick a side. No more delays, no more games. Either you stand with the forces of freedom, or you’re in league with [Nicolas] Maduro and his mayhem,” Mike Pompeo told the 15-member UNSC. Thus, both the attractor point, Venezuela, and the polar opposition were clearly established. The butterfly had emerged from its cocoon. Of the fifteen members of the U.N. Security council, Russia, China, South Africa and Equatorial Guinea stood in opposition to the U.S. However, other countries, who were not members, soon stepped forward to express their support not so much for Venezuela’s president, Maduro, but for the sovereignty of the nation and so against U.S. interference in its affairs: Turkey, Iran, Pakistan, Palestine, Mexico, as well as Cuba and Bolivia voiced their objections to U.S. interference in the affairs of the sovereign state of Venezuela. Greece’s left-wing ruling party backed Maduro. The countries that form the Bolivarian Alliance for the Peoples of Our America, known as ALBA, sharply condemned Luis Almagro, secretary-general of the Organization of American States, over his ongoing polemic against Venezuela. Of those Latin American nations who support the U.S, many have themselves been victims of American regime change and/or American interference in their domestic politics., and are to this day under the thumb of the U.S. American has had a long history of such imperialistic interference in Brazil and Bolivia (1964), Peru (1968) , Chile and Uruguay (1973), Argentina (1976), Paraguay (1989), Haiti (2004), etc., are some examples. The U.S. army itself intervened directly in Cuba (Bay of Pigs, 1961), the Dominican Republic (1965-66) and Panama (1989). They have never left Colombia which has the largest number of U.S. bases of any South American country. Thus, it is no accident that those nations who have tasted American imperialism and to a greater or lesser degree, have succumbed to it, support America in calling for a regime change in Venezuela: Colombia, Paraguay, Brazil, Argentina, Chile and others have recognized Guaidó, while Mexico, Cuba and Bolivia have stood with Maduro. Russia and China have condemned the US decision to interfere in Venezuelan politics. Russia is doing far more than simply expressing publicly its opposition to the attempted coup by the United States. Private military contractors who do secret missions for Russia flew into Venezuela in the past few days to beef up security for President Nicolas Maduro in the face of U.S.-backed opposition protests, according to two people close to them. Between Dec. 10 and Dec. 14 last year, an Antonov-124 heavy cargo aircraft, and an Ilyushin-76 transport aircraft, carried out flights between Russia and Caracas, flight-tracking data showed. Another Ilyushin-76 was in Caracas from Dec. 12 to Dec. 21 last year. All three aircraft belong to the Russian air force, according to the tracking data. In addition, Russia has backed Maduro’s socialist government with billions of dollars. According to reports, Russia has been trying to build a military base in Venezuela as well. Iran stands with Venezuela because it views it as part of the axis of resistance against US meddling and “imperialism.” From the time of Chavez, Venezuela has viewed the Middle East through the lens of the global far Left and Islamist politics and defined the US as an “imperial” power seeking regime change in the region. Under Chavez, Venezuela became a key ally of regimes in the Middle East that opposed the US and Israel. It has allied itself and in turn been viewed as an ally by the “victims” of US bullying, whether they be Iranians, Palestinians or the regime of Bashar Assad in Syria. He was particularly close with Mahmoud Ahmadinejad who got in trouble with his own press for hugging Chavez’s mother and reportedly saying in 2013 that Chavez would be resurrected alongside Jesus. While the socialist leaders of Venezuela, Chavez and Maduro, have formed alliances with countries in the Middle East who have been victimized by U.S. sanctions, threats and attempts at regime change, the loyalties of Maduro’s opposition in the Americas tend to be those countries that have close ties to Israel. Bolsonaro, Brazil’s new president, has openly expressed his support of Israel. Columbia and Argentina are also close allies of Israel. U.S. sanctions were at least partially responsible for pushing Venezuela closer to Turkey so that in December of last year the two countries cut economic deals that relate to oil, and to gold refinement in Turkey. In turn, Turkey has spoken out in support of Venezuela as the threat of a coup emerges on the horizon. The close Turkish-Venezuela relations arose as Turkey’s increasingly drifted into a worldview that is closer to Russia and Iran and more critical of or hostile to the US. https://www.jpost.com/Middle-East/The-Middle-Eastern-origins-of-support-for-Venezuelas-Maduro-578539. its demands upon the world without regard for the consequences. These actions would indeed call into being the rise of an opposition in the form of Radical Islamic Fundamentalism, which, being unable to face off against Capitalism on its own economic terms, proved inadequate in establishing any balance of power. Even though this kind of terrorism may endure for centuries, it will never prevail, but will rather exist under the constant conditions of constantly being destroyed by a world unified against it. No. The conditions necessary for the temporary rebalancing of our world are forming. With Venezuela as its attraction point, the chaos is giving birth to a new pattern. Two polar opposite sides are beginning to form, one the standing negation and further definition of the other; in a new time and new place a new socialism is once again facing off against a worn out Capitalism. The butterfly, now nearly completely emerged from its chaotic cocoon, is getting read to flap its two wings, and when it does, one cannot fully predict where and when the greater turbulence will arise, nor the kind of chaos that will emerge at another, higher level of human existence, before it too gives rise to a new system.